Finally, this coveted, affordable, and rare Town Home is available in IRB! Lovingly maintained, this clean, move-in-ready beach home is calling you to the Island life. Light, airy and freshly painted, the main floor greets you with water views from the dining room and has a very functional kitchen and spacious great room. Through the rear sliding glass door sits an enclosed, west facing, screened-in balcony with views of the Intracoastal. The private back stairs take you either down to the yard or up to the Master. Upstairs accommodates both bedrooms with the vast Master boasting an en-suite, large walk-in closet and 2nd private balcony with water views. The second bedroom has a grand window with an Intracoastal view as well. Top this off with an interior washer and dryer closet, exterior storage shed and dedicated covered carport! The beautiful, heated pool is directly on the water. Stairs from the seawall allow for kayak and paddleboard launches. Entertain and relax with a beautiful, well-equipped clubhouse or take a short stroll to the incredible Gulf of Mexico! 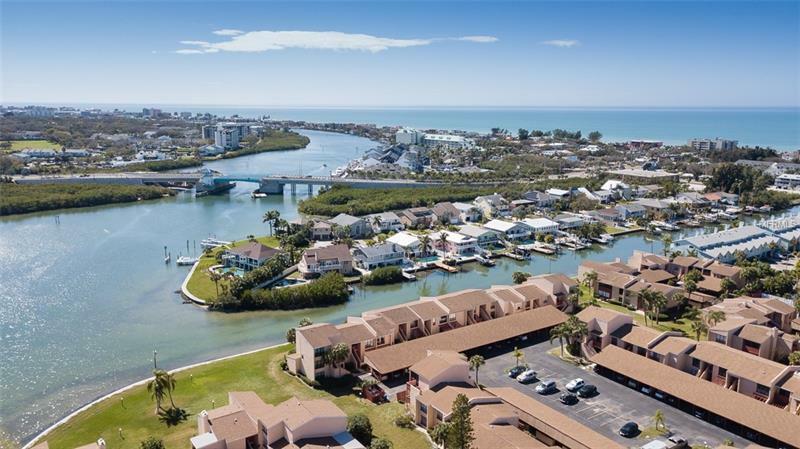 This wonderful beach town is situated just south of Clearwater Beach and boasts one of the finest stretches of beach in the state. With over 20 public beach accesses, there are no excuses to miss out on the unparalleled sunsets that kiss the sand each and every evening. A thriving beach community determined to stay small, coveted by locals and visitors alike and rich with incredible small businesses, festivals and events. Additional Water Information: Ladder for Kayak/Paddleboard launching.